The transition from early childhood education to primary school is a big step for all children, and a step which more and more children are having to take. Quality transitions should be well-prepared and child-centred, managed by trained staff collaborating with one another, and guided by an appropriate and aligned curriculum. Transitions like these enhance the likelihood that the positive impacts of early learning and care will last through primary school and beyond. While transition policies have been on the agenda of many countries over the past decade, little research has been done into how OECD countries design, implement, manage and monitor transitions. 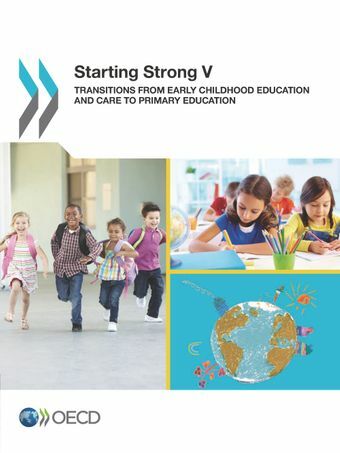 Filling these gaps is important for designing early years’ policies that are coherent, equitable and sustainable.This report takes stock of and compares the situation across 30 OECD and partner countries, drawing on in-depth country reports and a questionnaire on transition policies and practices. It focuses on the organisation and governance of transitions; and the policies and strategies to ensure professional, pedagogical and developmental continuity between early childhood education and care settings and schools. The report describes the main policy challenges highlighted by participating countries, along with a wealth of practical strategies for tackling them. The publication concludes with six “cross-cutting” pointers to guide future policy development. The following background reports have been prepared by the authoring country.